Kabul-based actress and director Saba Sahar presents her new movie ‘Nejat’ (The rescue). Saba Sahar does not correspond to the image of a suppressed Afghan woman. Two years back she introduced her first movie in Berlin with impressive self-confidence. She answered the journalists’ questions in a professional manner; as if it was her natural. Saba Sahar knows exactly what she wants: play a role in the reconstruction of her country’s culture - holding already the status being Afghanistan’s first woman dissertation writing as a producer and main actor to release a movie. When her first movie had its premiere in a Kabul cinema, the cinema’s owner ordered police protection to prevent riots. Actually there were only men to watch her premiere. But there weren’t any acts of violence, and later on many women came to watch http://justcougars.com/40-year-old-milfs/ her movie and encouraged Saba Sahar to continue with her work. The actress loves her culture, her language, as well as her country. She wants to live in Afghanistan. She is producing her movies for her compatriots, not for the international market. With the support of the German development cooperation and a big portion of faith her first feature film “Qanoon – the Law” was produced. With an inexperienced cameraman and a hand full of experienced actors she created a movie, which was very clear structured, simple and still touching. It is the story of the police officer Rabia, who, against her wish and as a result of her father’s pressure, has to marry a well-off businessman. But, as it turns out, her new husband’s business is drug dealing and child trafficking. This intriguing setup guarantees suspense till the end of the story. Surprisingly “Qanoon” turned out to be a great success in Kabul. The black market price of the DVD was even higher than that of any American blockbuster. 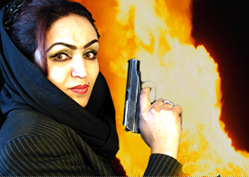 Like many new Afghan movies “Qanoon” contains a lot of violence. “In a country that has seen nothing but violence for more than 20 years, violence is nothing special to people, it’s a part of everyday life”, Saba Sahar stated. But her aim is to reach young people and they are known for loving action scenes. Beside all dramaturgic complications, Lollywood-style songs and the lovely choreographed martial-art-scenes – the difference to any other Afghan movie is: Her main character is a woman. Saba Sahar wants to be a role model, showing that women are able to go their own way, fulfilling themselves equally in occupations usually reserved for men. Even in an Islamic society, it is not predetermined to be only a mother and a wife. And Rabia, the police officer, finally makes her way, always fighting, riding motorcycles and using her gun if necessary. Saba Sahar knows, her story does not represent reality. But she hopes to show young Afghan women a way to feel more self-confident – and this would mean a lot at that point in time. Now Saba Sahar introduces her second movie. Again in the role of a police officer, but this time investigating undercover in the provinces. She wants to put an end to a drug baron’s tyranny. In impressive scenes the movie shows a small village in the powerful drug baron’s hands. As one of the poppy seed farmers, because of his faith, decides to plant crop instead of poppy, his whole family is killed by the Khan’s henchmen. As well as in her first movie, the antagonists are not just bad, especially the followers, the small ones, do have emotional moments and doubts. But because of the economic constraints and traditional dependencies, there is no perspective of living another life, or even getting a second chance. Saba Sahar’s movies show this tragic element of life in an impressive manner, and in an especially affectionate way. The production of the movie was supported by the Deutsche Gesellschaft für Technische Zusammenarbeit (GTZ) GmbH on behalf of the German Federal Ministry for Economic Cooperation and Development (BMZ).